There are no harmless political lies about a war. The more lies citizens tolerate, the more wars they will get. A desire to spread freedom does not confer a license to kill. When people blindly assume that their leaders are trustworthy, the biggest liars win. The worse government fails, the more gullible millions of people become. Most of the homeland security successes in the war on terrorism have been farces or frauds. As long as American presidents praise freedom, they are permitted to seize as much power as they please. Perpetual war inevitably means perpetual repression. When Bush attacked foreign nations, he also struck against American freedoms. Lies regarding the use of government power are almost never harmless errors. The more power a politician seeks, the more dangerous his lies become. As the Bush administration raises prospects of war with Iraq, USA TODAY asked writers to explore critical military, diplomatic and political factors involved and the possible consequences. This is part of that occasional series. Bush justifies a military invasion of Iraq based on his assertion that Saddam Hussein is a threat to the freedom of the world. But a desire to spread freedom does not automatically confer a license to kill. The USA should not pre-emptively attack Iraq unless it wants to inspire similar attacks in the coming years by other governments on alleged threats far from their borders. Wars are far more likely to liberate governments to use unlimited force than to free citizens from oppression. Bush’s own words indicate that he sees the conflict between the United States and the terrorists and/or Saddam as a simple question of evil vs. the greatest force for goodness in the history of the world. This dogmatic attitude, combined with his rosy-colored view of military force, encourages Bush to believe that only good things happen when he orders the U.S. military to kill bad guys. Historically, U.S. bombs have not always been a wonderful fertilizer for freedom. Few recent U.S. interventions have been followed by the blessings of liberty. * Operation Desert Storm in 1991 pulverized Iraq but did nothing to free the Iraqi people. At the war’s end, the first Bush administration effectively blessed Saddam’s crushing of revolts by the Kurds in the country’s north and the Shiite Muslims in its south. * Operation Restore Hope in 1992-93 resulted in U.S. troops battling the forces of a Somali warlord — killing hundreds of Somalis but suffering 18 high-profile casualties that devastated the Clinton administration’s image. After the USA withdrew, Somalia reverted to chaos, and its misery is unabated. * The 1994 Operation Restore Democracy invasion of Haiti sent 20,000 U.S. troops to tidy up one of this hemisphere’s most repressive countries. After they left, the old political violence resurfaced, and Jean-Bertrand Aristide, whom the U.S. government put back in power, is now being compared to “Papa Doc” Duvalier by Haitians bitter about oppression and corruption. * Operation Deliberate Force in 1995 featured heavy U.S. and NATO bombing of Serbian forces in Bosnia. After the bombing ended, a fragile peace agreement was crafted, and U.S. troops remain in the area. But the situation continues to be a powder keg and, once foreign troops leave, the locals will likely begin butchering each other with all of the enthusiasm they showed in the early 1990s. * Operation Allied Force in 1999 bombed Belgrade, Yugoslavia, into submission purportedly to liberate Kosovo. Though Serbian leader Slobodan Milosevic raised the white flag, ethnic cleansing continued — with the minority Serbs being slaughtered and their churches burned to the ground in the same way the Serbs previously oppressed the ethnic Albanians. Now, Bush’s claim of “liberating” Afghanistan is premature at best. The Afghan puppet government is one assassin’s bullet away from collapse. Most of the country remains either lawless or under the control of warlords, some of them brutal and bloodthirsty. Bush declared last month that “there is a line in our time . . . between the defenders of human liberty and those who seek to master the minds and souls of others.” But if the USA attacks the people of any foreign regime that refuses to swear allegiance to the latest U.S. definition of liberty, then the world will see America as the aggressor shackling the minds and wills of people around the world. The more nations America attacks in the name of liberty, the more millions around the globe will perceive America as the greatest threat to both their peace and their ability to run their own lives. Perpetual war will inevitably mean perpetual repression. When Bush attacks foreign nations, his administration will also be striking against American freedoms. The USA will betray the cause of freedom if it attacks every tinhorn despot and group of malcontents who disparage American ideals. Rather than seek to whip the world into an anti-Saddam frenzy prior to launching a new war, the Bush administration should admit that dropping 15,000-pound “Daisy Cutter” bombs on foreign lands does not automatically create political utopias. The United States’ military superiority does not confer a magic wand on its presidents to solve all of the problems in every corner of the globe. 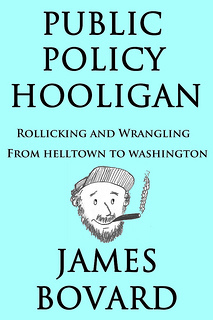 ***James Bovard, the author of Lost Rights: The Destruction of American Liberty, is finishing a book on the war on terrorism. President Bush, in his July 30 press conference, declared: “I take personal responsibility for everything I say, of course. Absolutely.” Bush made this declaration in response to a question about wrong information regarding Iraq’s attempt to purchase uranium in Niger. He hoped it would end a controversy that is eating away like an acid drip on his administration’s credibility. But the “16 words” — as Bush defenders characterize his reference to the attempted uranium purchases in his State of the Union address — were not the most brazen example of trampling the truth on the road to war. Lies regarding the use of government power are almost never harmless errors. The more lies officials are allowed to tell, the less chance citizens have of controlling the government. And the more power a politician seeks, the more dangerous his lies become. The fact that Bush went to war against Iraq based on false charges and a deceptive strategy is the key to knowing what to expect from the remainder of the Bush presidency. There is no reason to presume that Bush was more deceptive and manipulative on the war on Iraq than he is on the war on terrorism or other subjects. Whether Bush and his appointees will be held personally liable for their falsehoods is a grave test for American democracy. 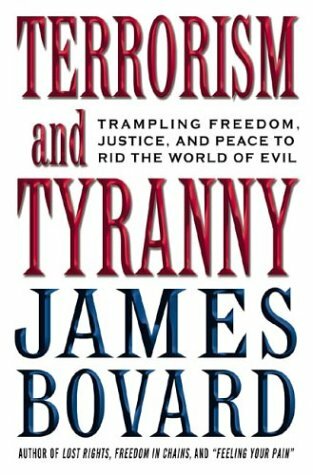 ***James Bovard is the author of the forthcoming Terrorism and Tyranny: Trampling Freedom, Justice, and Peace to Rid the World of Evil.